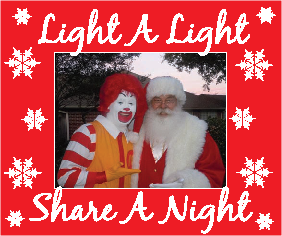 Help us celebrate the holiday season on December 4th and light up the Ronald McDonald House of Temple (RMHC of Temple)! By “sponsoring” a light for $10 each you will be helping the house provide guests with warmth, food, comfort and many other things they may be missing during their stay while their child is receiving medical treatment. You can honor a friend, teacher, co-worker or family member by purchasing a light now through January 1st. We will send an acknowledgement card to the person you wish to honor. Thanks to Christmas Décor and lots of volunteers, the House will be decorated inside and out. Share the magic of the holiday season with your friends and family and join us for food, entertainment, photos with Santa, children’s activities, and more! Kick off the Christmas season by lighting the House lights hung by Christmas Décor. We’ll have refreshments and entertainment. Brady Taylor, KWTX Meteorologist, will host the event along with Santa Claus. Lights will be lit during the 6 o’clock newscast on KWTX-TV. For more information, call the House at 254-770-0910.